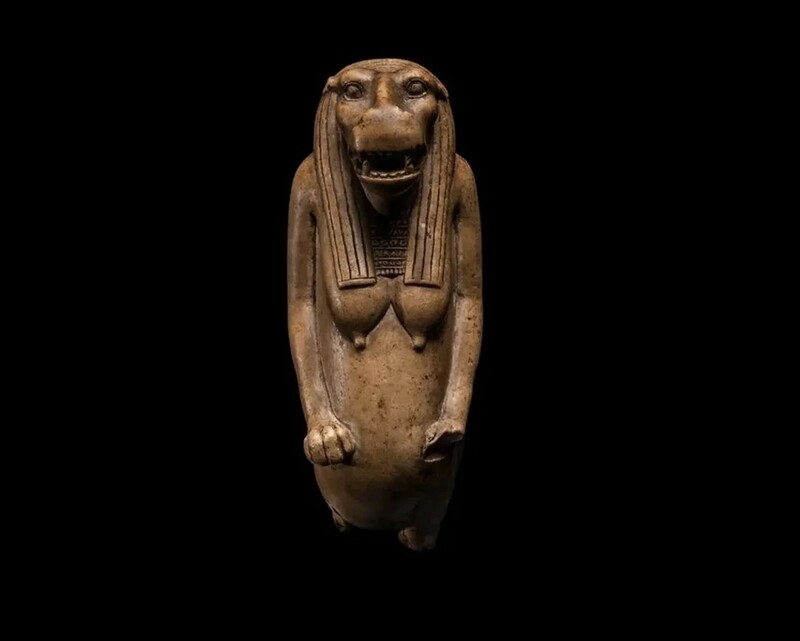 This statuette represents the goddess Taweret, an apotropaic goddess, whose domain was the protection of pregnant women and their babies, especially during childbirth. 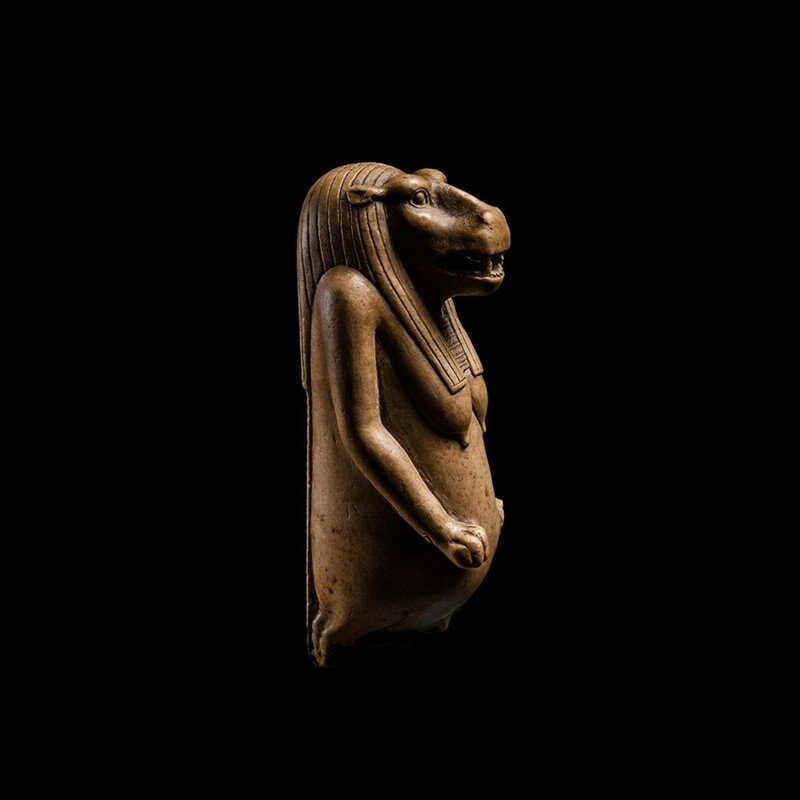 Her threatening image, intended to frighten away demons and other deadly creatures, combines human, hippopotamus, crocodile and lion attributes. Taweret or “Ipet” may have represented the constellation now called Draco (“the Dragon”) in which the star Thuban, the ancient north polar star, was located. An illustration can be found on Seti I’s tomb ceiling in the Valley of the Kings (cf. Z. Hawass, The Royal Tombs of Egypt, London, 2006, pp. 277-278). Probably due to her celestial importance, Ipet was conflated with Nut and Hathor, as a sky goddess and protector of the sun. 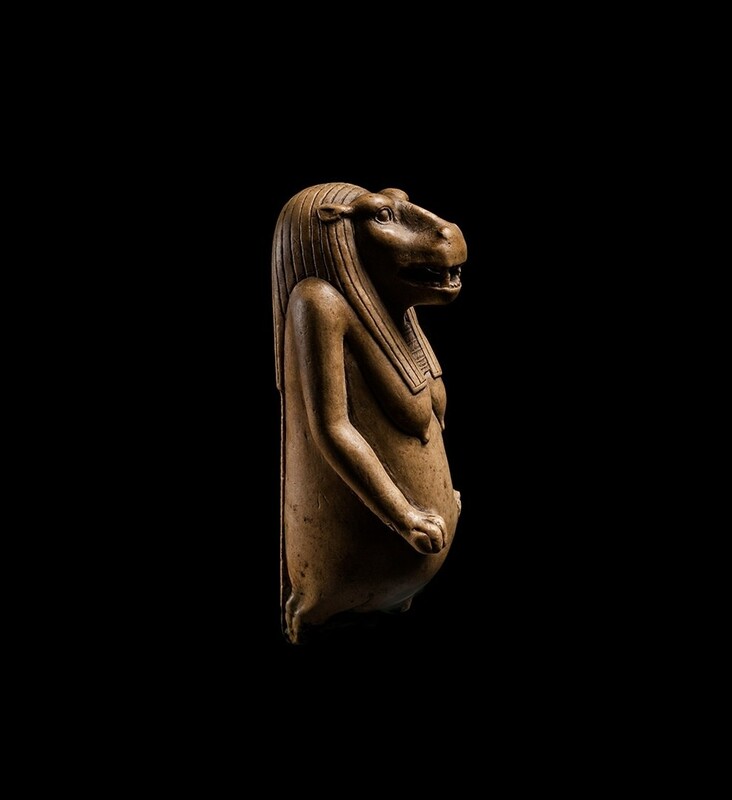 As a hippopotamus, symbol of fecundity, this statuette could protect pregnant women from malevolent forces. The family unit was an important feature of ancient Egyptian life, both for humans and for the divine. Establishing a household and producing a child, particularly a son, was very important for the Egyptians. However, in pre-modern cultures, pregnancy, birth and the postpartum period were dangerous for both mother and child. Although we do not have exact rates of child mortality in ancient Egypt, it can be said that a mother would be lucky if half her children lived to be adults. The ancient Egyptians had remarkable medical knowledge, however hand in hand with practical applications of medicines and other ‘scientific’ therapies, the ancient Egyptians would also make use of magical or religious interventions to address health issues. They considered the recitation of spells and prayers as well as the use of amulets or figurines as appropriate treatments for an illness or the answer to a personal problem. 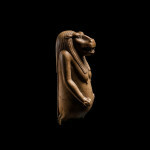 Figurines of Taweret, such as this one, may have therefore been given as gifts, kept in household shrines, or dedicated at local temples in hope of, or thank for, a successful birth. 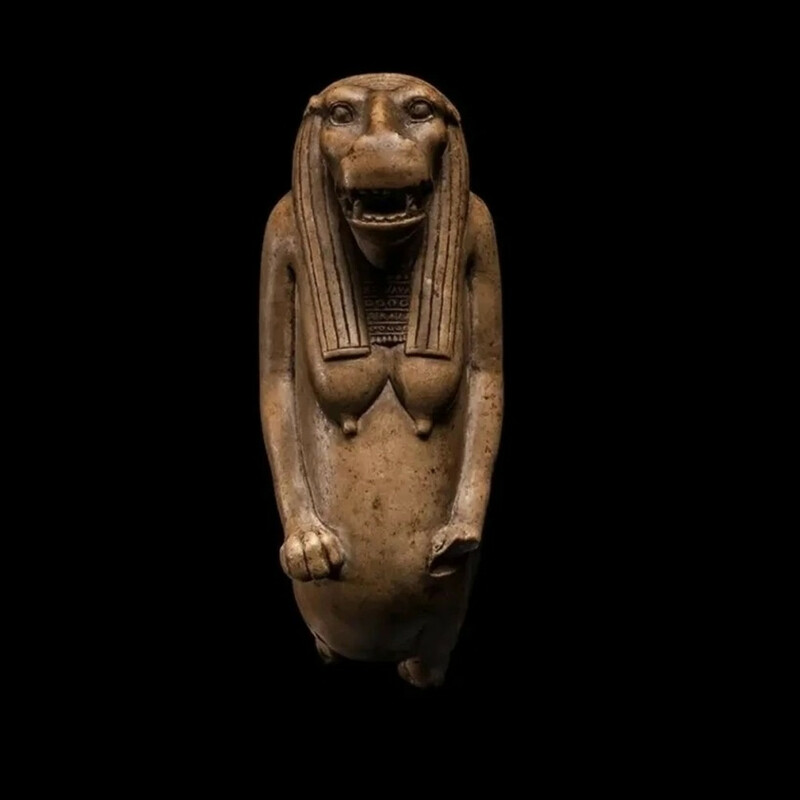 This figure of Taweret, portrays the hippopotamus goddess pregnant and standing in a human manner. Her mouth is open, displaying her denuded teeth. 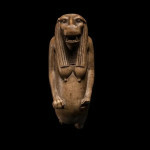 She wears a striated tripartite wig and a large flowered necklace around her neck. Her full chest covers her belly, and she has a crocodile tail along her back. This beautiful statuette’s almost perfect condition, exceptional craftsmanship and size suggest that it was most probably created for a temple. Acquired on 12th January 1898 from Rollin & Feuardent, 4 rue et place Louvois in Paris for 160 Francs. Accompanied by a copy of the original invoice from 1898 (see below). Recorded in the account of Charles Gillot in January 1898. 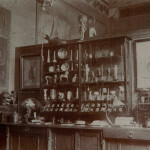 The Tawaret can also be seen in a photograph of the Gillot Collection in the 19th century. Gillot Family Collection until 2008. Sold at “Ancienne Collection Charles Gillot (1853-1903)”, Mardi 4 et mercredi 5 mars 2008, Christie’s, Paris, Lot 114. Accompanied by French Cultural Passport (099169). Charles Gillot, born 18th March 1853, was the son of Firmin Gillot (1819-1872) a printer and inventor, who revolutionised the bookmaking industry by inventing ‘paniconography’, also called gillotage, a process allowing the simultaneous printing of text and image. On his father’s death, Charles Gillot took over the family printing business in the Faubourg Saint Martin, and subsequently made significant improvements to his father’s invention by incorporating the photographic discoveries of Daguerre and Niepce. His work won awards at all the Great Exhibitions and earned him appointment as a Knight of the Order of the French Legion of Honour in 1886. He is however best remembered as a great collector, who built a magnificent collection including admirable examples of 14th century Mamluk art, 13th and 14th century French sculpture and works of art as well as a fine selection of Egyptian antiquities. In the Journal des Arts of 19th March 1903, Raymond Koechlin hailed Gillot’s taste in these terms: “Above all, it was character that he sought in works of art, and that is why his taste was not exclusive he also found the character he liked in Japanese art, in Gothic art, in Oriental Art, and in the lovingly arranged display cases of his gallery items where every age rubbed shoulders together in perfect harmony. 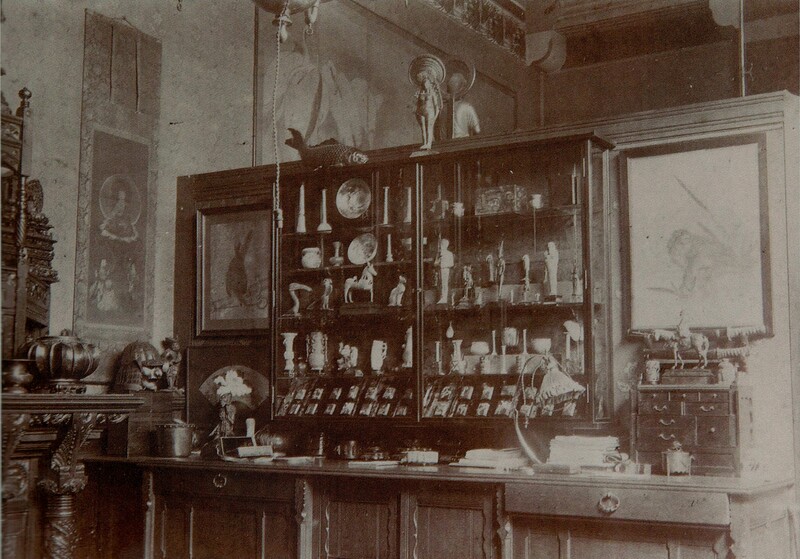 Never did a collection better reflect the personality of its originator, and never did a collector collect more for his own pleasure, to satisfy his own eye.” Charles Gillot died on 17th March 1903 in Paris and was buried in Montparnasse Cemetery. In 1904, part of his collection was auctioned at the Durand-Ruel gallery in Paris. 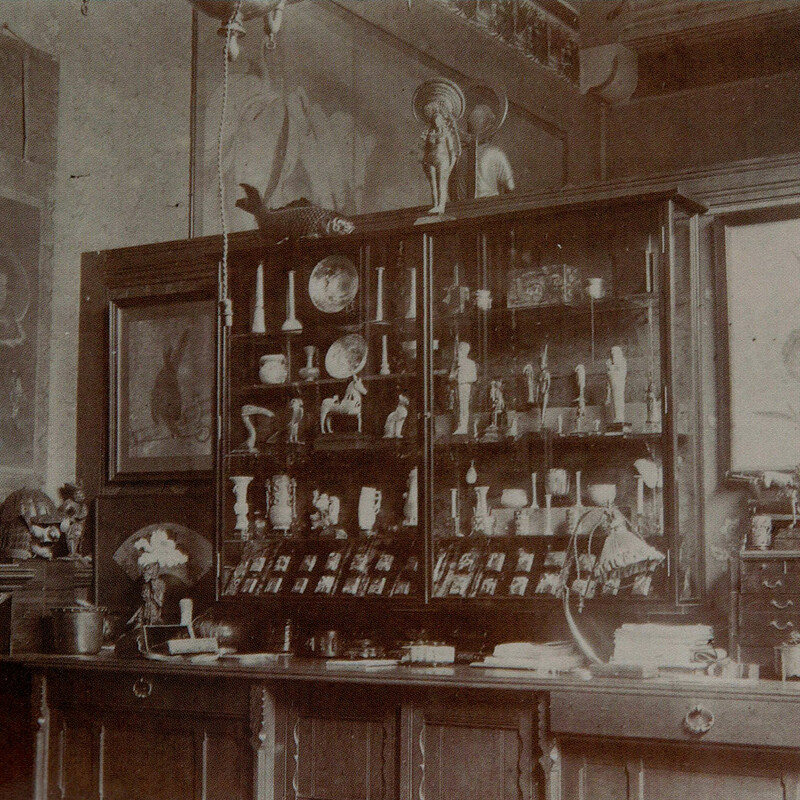 Samuel Bing, a famous dealer and friend of Charles Gillot, was the expert in charge. With 3,453 lots listed in two thick catalogues, the sale was a major event. Even today it constitutes a reference in the history of auctions. “Ancienne Collection Charles Gillot (1853-1903)”, Mardi 4 et mercredi 5 mars 2008, Christie’s, Paris, Lot 114.